I wonder if this was done with my new engine? I guess I can only hope the RHS block was machined exactly to specs. The more I read about this, the more I'm thinking that this really needs to be checked in my C5Z. I know the RHS block is a quality piece of metal, but still, this alignment really needs to be done periodically even when just replacing a clutch, and surely replacing either the engine block or the bell housing itself, I would think this check would be as a matter of course, a requirement. I am very doubtful that either Chris Harwood or Aaron Scott checked it at any time. And certainly the problems I have been having with my drivetrain ever since could very likely be exhibited by a misaligned bell housing when the new engine was put in. 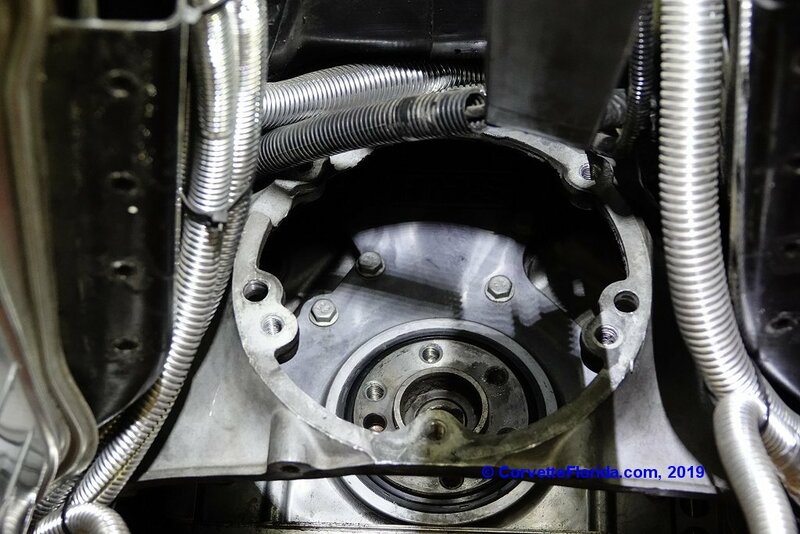 I can see where the pilot bearing would become prematurely worn, as well as the front torque tube bearing because of the angle forced on the input shaft. Perhaps even the clutch disk itself and the throwout bearing. The odd noises I have been hearing could be the clutch disk not mating flush between the pressure plate and the flywheel when I take pressure off of the clutch pedal and those surfaces start rubbing together at a slight angle. I would expect to see the outside edge of the clutch disk perhaps having much more wear than the rest of the surface area on the disk. But a wrinkle in this theory is why would it be intermittent? Unless something that is supposed to be fixed, is not as fixed as it is supposed to be. I would think that ANY misalignment would cause some serious vibration. Rich,whadda ya got to lose??? If you do it and it's within tolerance, you'll ABSOLUTELY know it's not the problem. If it IS out of spec, you will be able to correct it, and know it's right. Then put it back together, and retest. If the driveline noise is still there, it's not the alignment. It might be a problem that was caused by the former misalignment problem, but it won't be the alignment itself. OK, I just answered my first question..........I forgot that the entire driveline has to come out to get at the clutch and bell housing. A little more complicated than I originally thought, but with the entire driveline out, you'll be able to eyeball everything to look for wear spots. I would imagine that with the driveline making those noises, there's gotta be some wear spots showing up somewhere.......! I took the car out for a little ride today, and the drivetrain didn't make even a peep. However I did note that it seems to be some resistance going into gears as I am shifting. Kind of like the clutch isn't releasing completely when the clutch pedal is pressed to the floor. The big problem here is that every drive train noise issue I have tried to track down on the internet for info and comparison, none of them have been intermittent. They have been pretty much on/off switches. Either makes a noise or it doesn't. Either bad or it is not. None of this middle of the road crap. So what would make an intermittent metal to metal rubbing/grinding noise? Something not tightened down and loose, therefore moving around, sometimes causing an alignment issue and therefore subsequent noise, and other times not? In hindsight, I was getting intermittent noises when bolts were missing and others loose that mounted the bell housing to the block. Well gee, now just how in the heck would you use a dial indicator on THIS bell housing in order to check alignment? And yes, that is looking at the bell housing on my C5Z. Old picture, or do you have it apart again? But to answer the question posed.........I would get someone that knows what they're doing, to do it for me. Trouble is..............finding someone that knows what they're doing! Picture was taken yesterday (04-17-2019). So yes, the car's guts are laid bare again. And also yes, I have someone who I believe knows what they are doing looking at it. Never mind, I read further.